What is the Japanese terminology for a falling leaf break fall? For those who do not know what it looks like. From standing, you would train it by putting both hands on the floor, kicking your legs upwards (almost to an hand stand), and lowering your arms as your legs go down in a see saw motion -- looking like a falling leaf. It is the ukemi that you would do when (for example) tori does oahitaoshi from kneeling. Or the ukemi from Hiki taoshi. In the drawing of hiki taoshi below, the falling leaf breakfall is what uke does in steps 7 to 10. Yes, I believe this is called, "zempo ukemi". Note that this is not "zempo kaiten ukemi". The "kaiten" part means rolling, and without rolling, you simply have "zempo ukemi". It describes the Zempo Ukemi as a "forward fall using forearms and thighs or toes to cushion the fall. It is also recommended turning the head to one side to avoid a blow in the face." It seems the author of that article also sees this as a "zempo ukemi", but isn't completely sure about the name. In Aikido circles, I see this often referred to in English as the "soft" version of the front breakfall. And in English, I see it often referred to as "The Worm" breakfall (probably named after the dance move by the same name). Oh, and I've also seen it referred to as "The Wave" breakfall. I think the reason for the naming confusion might be that this actually has no specific name in Japanese. 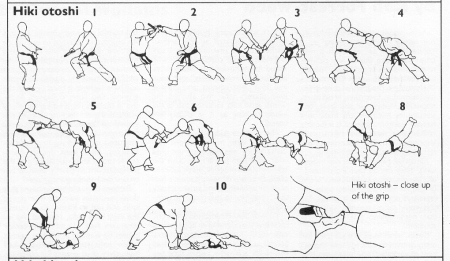 There are many versions of "mae ukemi" (front breakfalls), each with a particular variation. Like you might see a traditional front breakfall, the kind without the rolling, but instead of falling down straight, you do a kind of split outwards with your legs and fall from the center of mass instead. We used to call that a "parachute" front breakfall, because you're straddling your legs out like a parachute. But in Japanese, this is still just called mae ukemi. They don't usually distinguish it from the regular version. And there are other types of mae ukemi as well. They're all named "mae ukemi". Like the Bujinkan ninjutsu guys have a variation of mae ukemi where you go down on one knee while pressing back up into the air with the other leg. That's about all I can offer on this subject. zenpō ukemi: 'zenpō' or 'zenpou' literally meaning 'forward' or 'frontward'. mae ukemi: 'mae' literally meaning something like 'in front' or 'before'. I myself have made the experience that at least in Germany, the second one is used more frequently, see e.g. here. I personally have never heard zenpō ukemi or zenpo kaiten ukemi before. But after searching for quite a while now and having read into some international books from different budo sports, I came to the conclusion that while mae ukemi is more common for this ukemi, the forward rolling ukemi is more commonly called zenpo kaiten ukemi, see e.g. here and here - written by a japanese-canadian hachi-dan in Judo - on pp. 69 and 70 (kaiten literally meaning 'rotation' here, making it simply a 'forward roll ukemi'), instead of the also known 'mae mawari ukemi' (see the Aikido guide above), mawari literally meaning 'circulation' or 'rotation' as well. This actually makes some sense, as while in mae ukemi you just fall straight 'in front' of yourself, zenpo kaiten ukemi is a more extensive, forwarding movement, justifying the change in vocabulary. I'd say it's a Mae Ukemi, although I think calling it Zempo Ukemi would be as correct. As many have alredy noted, the term Zempo Ukemi is not to confuse with the "shoulder roll", or "rolling fall": Mae Mawari Zempo Kaiten Ukemi (which can be either migi or Hidari, depending on the shoulder on which you roll ).